Made in Solingen, Germany Wusthof have set the standard for designing and manufacturing precision forged knives since 1814. Renowned for their uncompromising quality in the art of knife making, each Wusthof knife is precision forged from a single piece of specially tempered, high carbon, stain resistant steel. The result is a razor sharp edge that stays sharper for longer. 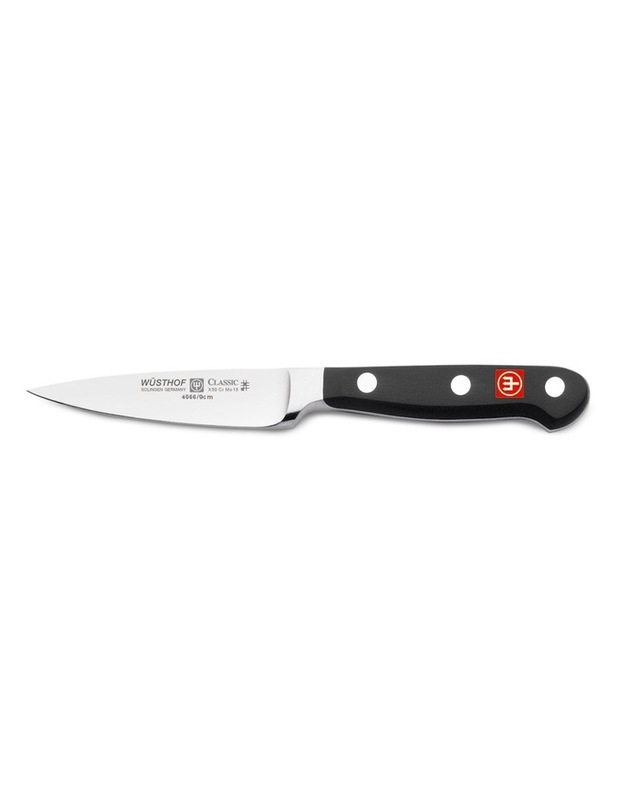 The sharpness of a Wusthof knife is guaranteed for life. Manually honed twice by hand and tested for superior sharpness. Each Wusthof knife is accompanied with a complimentary knife sharpening service to make certain your knives stay sharp for life. Paring Knife features a short tapered straight edge blade that provides greater control for those inticate cutting tasks. The short blade is also ideal for peeling, coring, cutting small fruits and vegetables as well as decoritive garnishing. Like all other Wsthof knives, the Paring Knife is forged from one piece of specially tempered, high carbon, stainless steel. Lifetime warranty on all manufacturing faults and defects.